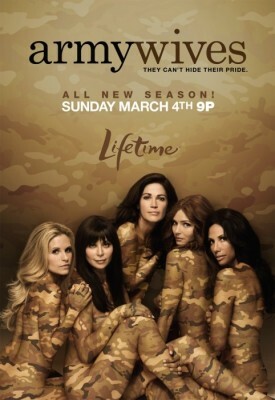 Here are the most recent TV ratings for Army Wives on Lifetime. The TV show’s ratings are the best way to tell if it will be cancelled or renewed for a seventh season (though it’s believed that the show is actually ending). The sixth season of Army Wives airs Sunday nights. The show revolves around a diverse group of women – and one man – who live with their spouses and families on an active army post. The current cast includes Brian McNamara, Brigid Brannagh, Catherine Bell, Drew Fuller, Katelyn Pippy, Kim Delaney, Sally Pressman, Sterling K. Brown, Terry Serpico, and Wendy Davis. Will there be a seventh season of Army Wives? Final season averages: 1.0 rating in the 18-49 demographic with 3.08 million total viewers. 1.0 demo rating (0% change) with 3.30 million (-2% change). Season averages: 0.98 in the demo with 3.08 million. 1.0 demo rating (-17% change) with 3.37 million (-6% change). Season averages: 0.98 in the demo with 3.07 million. 1.2 demo rating (+9% change) with 3.57 million (+20% change). Season averages: 0.98 in the demo with 3.06 million. 1.1 demo rating (+22% change) with 2.97 million (+6% change). Season averages: 0.97 in the demo with 3.04 million. 0.9 demo rating (0% change) with 2.82 million (-4% change). Season averages: 0.96 in the demo with 3.04 million. 0.9 demo rating (-18% change) with 2.92 million (-16% change). Season averages: 0.97 in the demo with 3.05 million. 1.1 demo rating (0% change) with 3.49 million (+6% change). Season averages: 0.97 in the demo with 3.06 million. 1.1 demo rating (+22% change) with 3.29 million (+9% change). Season averages: 0.96 in the demo with 3.03 million. 0.9 demo rating (-10% change) with 3.02 million (-9% change). Season averages: 0.95 in the demo with 3.02 million. 1.0 in the demo (0% change) with 3.33 million total viewers (+20% change). Season average: 0.96 in the demo with 3.02 million. 1.0 in the demo (+25% change) with 2.77 million total viewers (+6% change). Season average: 0.95 in the demo with 2.99 million. 0.8 in the demo (-11% change) with 2.61 million total viewers (-15% change). Season average: 0.95 in the demo with 3.01 million. 0.9 in the demo (0% change) with 3.07 million total viewers (+9% change). Season average: 0.96 in the demo with 3.05 million. 0.9 in the demo (-18% change) with 2.81 million total viewers (-12% change). Season average: 0.97 in the demo with 3.04 million. 1.1 in the demo (+22% change) with 3.18 million total viewers (+9% change). Season average: 0.98 in the demo with 3.07 million. 0.9 in the demo (0% change) with 2.91 million total viewers (-6% change). 0.9 in the demo (+13% change) with 3.10 million total viewers (+19% change). Season average: 0.97 in the demo with 3.07 million. 0.8 in the demo (0% change) with 2.60 million total viewers (-4% change). 0.8 in the demo (-11% change) with 2.70 million total viewers (-5% change). Season average: 1.02 in the demo with 3.16 million. 0.9 in the demo (-10% change) with 2.83 million total viewers (-7% change). Season average: 1.08 in the demo with 3.28 million. 1.0 in the demo (-17% episode-to-episode change) with 3.04 million total viewers (-16% change). Season average: 1.13 in the demo with 3.43 million. 1.2 rating in the 18-49 demographic with 3.63 million total viewers. Season average: 1.20 in the demo with 3.63 million. What do you think? Do you like the Army Wives TV series? Do you think that season six should be the end? My husband & I just found this show and it is one of the best written shows on TV. Appreciate a show where honor, country, family, and marriage is upheld to a higher standard. Finally a show realistic to life. d on’t take army wives off. i really do like it. bring back season 7. I hope Army Wives continues! Please dont end army wives. This is the first series that I have been in to watching in a very long time. I watch every sunday and then I also buy the DVD becauase I enjoy watching them again. I looked forward to my sunday evening. Even after they put the show on later and I would have to get up at 5:30 in the mornings for work. This is the best so to be aired in a very long time.